In the first two weeks of April, religious groups and leaders across the United States signed a letter to President Obama and Secretary of State John Kerry, hoping to influence U.S. foreign policy on Colombia steering aid to peace actions. Their action came as the government of the South American nation was beginning peace negotiations with the guerilla FARC group after decades of conflict. Part of the Latin America Working Group's eighth annual Days of Prayer and Action for Colombia, the letter has been signed by faith leaders like Rev. John L. McCollough, president and CEO of aid and development group Church World Service and Ervin R. Stutzman, executive director of the Mennonite Church USA. During the week, Pax Christi USA also signed the letter. "As the Church, our hearts should break when we hear our Colombian brothers and sisters cry to God for justice and weep for their family," the Mennonite Central Committee U.S. wrote on its blog. 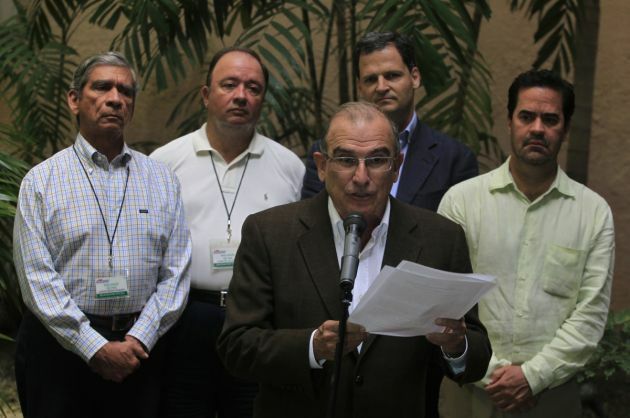 In addition to "fair and meaningful" reparations for victims of the five-decade-long unrest and dismantling of "illegal armed groups," the letter also calls for a "substantial" reorientation of U.S. aid to Colombia. "U.S. foreign assistance funds should support the peace process and the implementation of peace accords," the letter reads. The national, faith-based humanitarian agency, Witness for Peace, says the U.S. has given nearly $8 billion to the Colombian government to arm and train the military. The violence in Colombia began in the 1960s when peasants formed FARC in response to government attacks on rural communist pockets. Its stated goal was to overthrow the government in favor of a Marxist regime. Since then, an estimated 600,000 people have died and 3 million have been displaced in the South American country. Peace talks between the government and FARC began in October 2012 in Norway and moved to Cuba in November where they continue. Tens of thousands of Colombians have taken to the streets in recent months to march in support of the talks.